I Hate You Messages for Ex-Girlfriend: Feeling heartbroken? Feeling lonely? Feeling sad and depressed? Feeling cheated on? Feeling betrayed? Read this post and reflect on the way your relationship ended. Moving on from a breakup is not easy and all you can do is let time heal your wounds. The most important thing to remember is that you are not alone – there are millions of other broken hearts out there waiting to find true love. Meanwhile you can channel your feelings for your ex by writing a quote that mirrors the emotions you are going through. Post it on Facebook and Twitter or send it to all your friends by text and WhatsApp messages. Don’t take any names so that you avoid getting into a spat with your ex. 1) The heartbreak you have given me is a hurricane that will last long. But I promise, I will pick myself up and come out strong. There will come a day when I will stand tall and rise above. Then you will realize how big a mistake you made by betraying my love. I hate you. 2) I trusted you blindly, you lied to me blatantly. I lusted after you crazily, you cheated on me heartlessly. I loved you endlessly, you betrayed me mercilessly. I hate you. 3) Falling in love with you will be my life’s biggest regret, I will never forgive and forget. You are a cheater and a dirty liar, I will hate you forever and ever. 4) Our love gave me wings which you clipped mercilessly. Our love set me free but you chained me in heartbreak’s captivity. Our love made me smile but your lies stole all my happiness. Our love was precious but it was ruined by your heartlessness. 5) I loved and treasured your heart like a trophy while you kicked mine around like a football. I hate you. 6) Time will slowly heal me and pull me out of misery. But I hope karma slowly gives you wounds that you deserve in your destiny. I hate you. 7) Why did you pretend to like it when we used to kiss and caress? You could have just told me that you were lusting after someone else. I hate you. 8) I hope karma rips off your life’s happiness, just like how pushed me into sadness. I hope someone breaks your heart, just like how you lied to me from the start. I hope you rot in agony permanently, just like how I hate you endlessly. 9) I gave you my heart and in return you gave me lies. You will move on easily but who will wipe the tears in my eyes? I hate you. 10) Why did you have to lie to me all this while when you could have just told me that you didn’t love me. Yes, it would have broken my heart but at least I would still have my respect and dignity. I hate you. 11) You look so beautiful and pretty – how did your heart turn out to be so ugly and dirty? I hate you. 12) Looking at you reminds me of something beautiful, like a heavenly abode. But feeling your heart reminds me of something dirty, like a filthy commode. I hate you. 13) You smeared the innocence of my love with your lies. Now I will hate you till the day that I die. 14) From being the best decision of my life to becoming the biggest mistake I had ever made, asking you out was a blunder for which I have heavily paid. I wish I could turn back time and never have met you in the first place. But since I can’t do that I just hope I never again, see your ugly face. I hate you. 15) You made me feel that true love and trust are the weaknesses. But don’t worry, one day I will find someone who sees them as my biggest strengths. I hate you. 16) Even after the way you walked away I won’t stop myself from falling in love again. 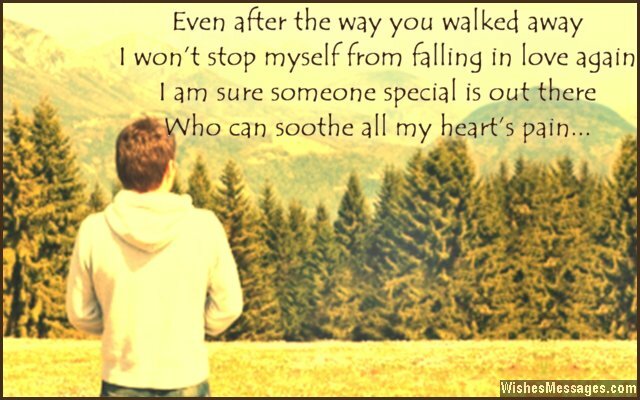 I am sure someone special is out there who can soothe all my heart’s pain. I hate you. 17) I am glad I took a lot of selfies with you. At least I have proof to show everyone that I danced with the devil. I hate you. 18) I hope nobody breaks your heart the way you broke mine. Yours should be broken at least ten times more cruelly. I hate you. 19) You promised to give me wings, but you pushed me in a ditch instead. I hate you. 20) I don’t blame myself for falling in love with you. After all, my eyes could only see how beautiful you are. It was my bad luck that beneath all that beauty, was a heart darker and more toxic than tar. I hate you. 21) I am heartbroken, but at least my love was true. 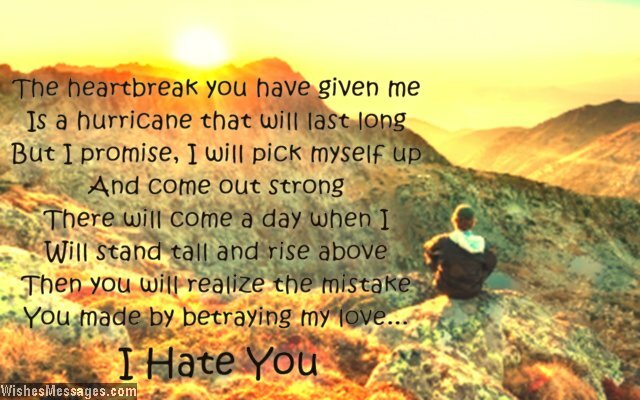 Time will erode the heartbreak, but I will never stop hating you. 22) No one forced you to love me, so why did you need to pretend? Your lies have left me heartbroken, and I hate you till no end. 23) I may never be able to completely trust anyone again. I just don’t want to risk going through all the pain. I will think a hundred times before giving my heart to someone. Love is something that I will now try to shun. People will probably see me as heartless and void of emotions. I hope you can see how you have pushed me into a state of loneliness and depression. I hate you. 24) I still keep thinking about you even after all these months after our breakup – but don’t worry I don’t Miss You, I just Hate You. 25) I will mend my heart, slowly but surely it will be rebuilt. But how will you survive, how will you live through the guilt? 26) You will move on, you will eventually be happy. I will be depressed, I will forever be lonely. You will find someone else, you will get someone’s affection. I will rot away in my heartbreak and cower into my seclusion. I hate you. 27) I didn’t choose to fall in love with you because it was my heart’s calling. But now I choose to hate you because you have left me heartbroken and rotting. 28) Love is blind and I hope it continues to be. I can’t blame love just because you betrayed me. I hate you. 29) I don’t want to express my heartbreak aloud in words. If I did, it would be the nastiest thing you have ever heard. But let me tell you something that I need to get off my chest – until karma comes back and bites you, my hatred towards you will not rest. 30) My love was so vibrant that it made even the colors of the rainbow look drab. But you destroyed it by piercing my heart, jab after jab. I hate you. 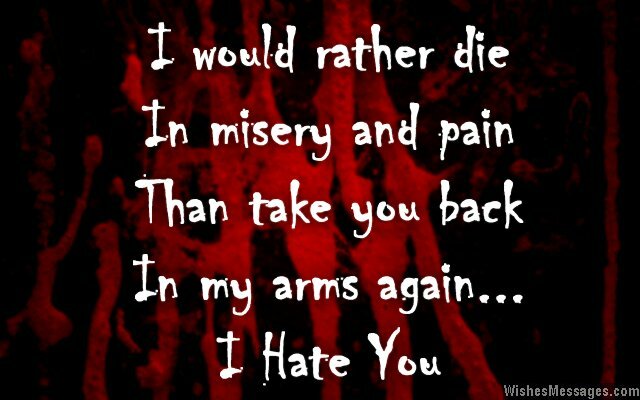 31) I would rather die in misery and pain, than take you back in my arms again. I hate you. 32) I gave you my love and in return you gave me heartbreak. You are pretty on the outside but deep down inside you are a vicious snake. I hate you. 33) You already know that my heart is rotting in loneliness. But what you don’t is that yours is rotting in malice. I hate you. 34) I don’t want to take revenge for how you stabbed my heart with lies. But I hope karma gives you what you deserve – I can’t wait to hear your heart’s cries. I hate you. 35) My only goal, was to enter your soul. While yours was to, take advantage of my love so true. I hate you. 36) My life was a beautiful medley of smiles and priceless memories when I loved you from the bottom of my heart. But thanks to you, my life has now become a mosaic of nightmares, loneliness and heartbreak. I hate you. 37) If you like someone else you could have just told me, I would have let you walk away. It would have been difficult but at least I wouldn’t have had to see these painful days. I hate you. 38) My heartbreak is the only proof, that I loved you. My tears are symbolic, of how deeply I was into you. The emptiness of my sadness’ silence show how much I hate you. 39) I should shame you on Facebook and Twitter for what you did to me. But I won’t, because that won’t make me any different from you. I hate you. 40) You may have dumped me and broken my heart, but I still believe in true love’s glory. I am not going to let the actions of a heartless person like you smear my idea of something so heavenly.